Polka Dot Overload | Sewing, knitting & vintage projects, tips, tutorials and cartoons! : Finished: Draped, wrap-style (T-shirt) wedding dress! Finished: Draped, wrap-style (T-shirt) wedding dress! Making this dress was so much fun I kinda wish I could go back in time and sew my own wedding dress instead of worrying that I didn't have the right skills. 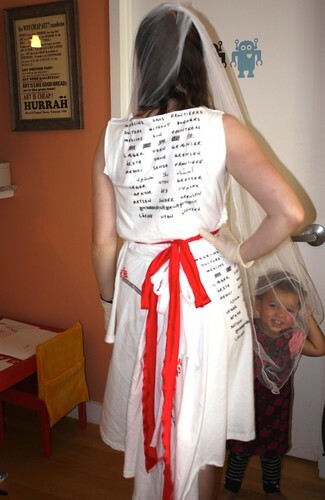 My T-shirt wedding dress costume was a big success--it fit the star of the little skit perfectly and garnered lots of compliments. (It's not quite as good a fit on me--the wearer was half a foot shorter than I am). Inspiration: I won't get into all the insider details of the skit (which we put on at an informal afterparty for our general assembly). 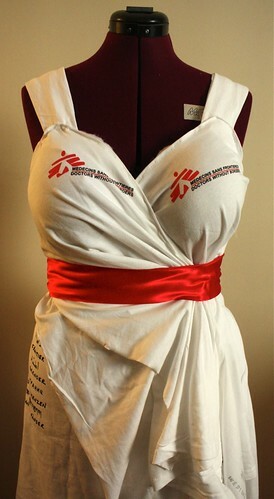 But the basic idea was that the people who are part of the international Doctors Without Borders/Médecins Sans Frontières (MSF) movement care about MSF so much, we would actually marry it. It's not much of an exaggeration, either--we are a passionate, committed--you might say obsessive--bunch. 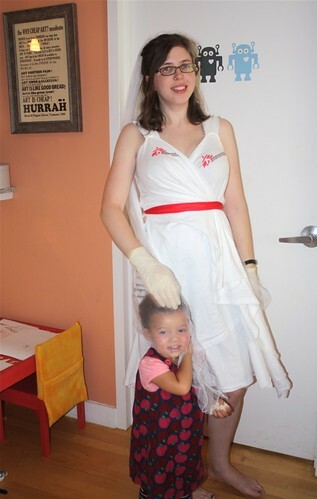 So the skit had a wedding theme, and the character who wore the dress was the personification of MSF. 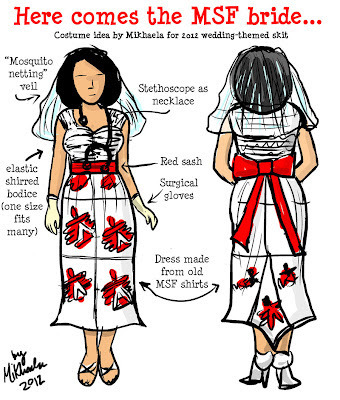 Pattern Description: Two-piece wedding dress. Top has a draped/surplice wrap style with wide straps secured with a tie. Skirt has loose elastic waist and back bustle/flounce that secures with several messy ties. 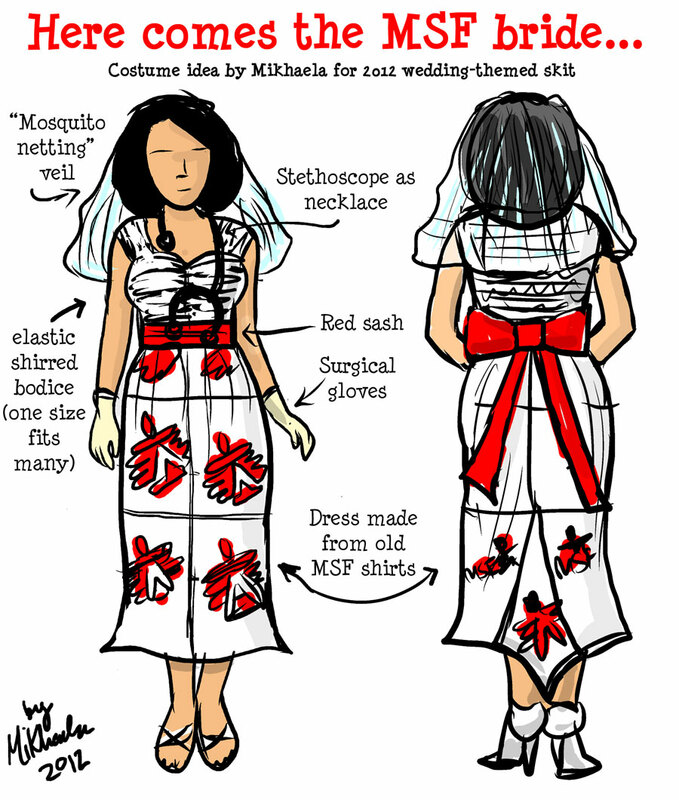 Cheap single-faced discount red ribbon, a mosquito-netting veil, surgical gloves and a stethoscope complete the medical humanitarian look. 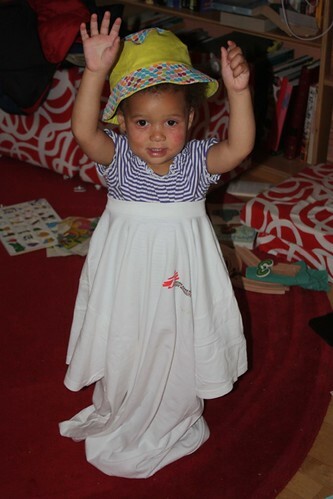 Fabric: Dress made from old XL MSF T-shirts from the office storage closet. Veil made from a cheap non-chemically-treated white mosquito bed net (I just cut a few strips of the netting and sewed them to an old haircomb). Back at the sewing machine. Everyone loved it, especially the wearer. I actually sewed something for someone who wasn't my husband or daughter. "Draping" (or my sad attempt at such) is fun. NONE. It got the job done. Would you sew it again? Would you recommend it to others? I won't sew it again, but I do recommend playing around with knit fabrics on your dress form if you have one, and just seeing what happens. Wear to: A skit. Or maybe just around town to help spread the word about MSF. (I did actually try this on at my sewing club, though I didn't wear it home for fear it would fall apart on the way). P.P.S. 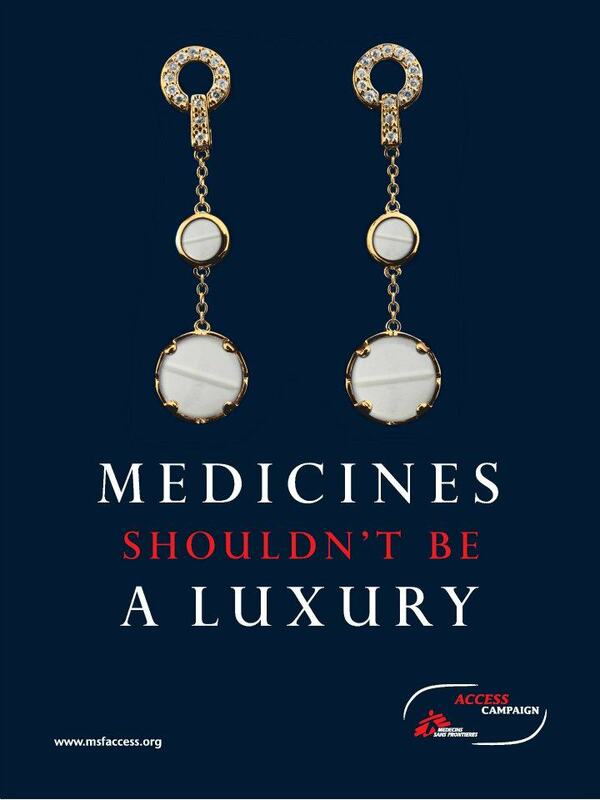 I would be remiss in not getting on my soapbox for a minute with a poster from the advocacy side of MSF about access to essential medicines for all. Look closely. Accordingly, today's question doesn't relate to sewing: What issues are you most passionate about? I'm not sure I have a most passionate since I see so many issues as being increasingly interconnected - climate/poverty/healthcare - there is a complex web at work and I'm not sure you can solve only one piece. Sort of like a Rubik's Cube. That said, I do what I can and I feel strongly about women's issues, globally. you have a little draper on your hands! isn't it fun? i love the back effect on your dress. very cool wordage placement. Well since you asked.. I believe medicine shouldn't be a luxury, too.. In fact, I firmly believe that healthcare is a human right. Absolutely. I'm pretty passionate about environmental conservation, too.. And learning to live a more and more sustainable life. And there's more... Of course... Right now I'm working on a charity event for a local Hospice... So that's cool- supporting the terminally ill and the people who work with them. I agree that medicine shouldn't be a luxury. It's incredible how many things can be cured with so little. I'm going to stay out of the political realm with my answer just because that's how I was raised though my #1 is very political in nature. My #2 is opera education. It makes me livid when I see opera treated as something for only the elite. While it has a historical basis for this, I want to see it stick around for as long as possible and the only way to do that is to make sure that the next generation knows and understands and can appreciate it. And what's not to appreciate? It brings together all of the arts as well as a lot of other disciplines--if the sing through your nose or make your throat bleed aesthetics of other genres can be enjoyed, why should opera singers get a bum rap? And even if the stories are sometimes silly, the music is rarely anything but glorious. That's my dream job: working for an opera company teaching kids about opera. I can't help you with the sequins, but I think wooly nylon sounds like a good plan. Do you have Fabric Saavy? I'm sure it would have a good recommendation on needles and thread. I would LOVE to drape knits on a dress form, but sadly, I do not have one, but if I ever get one, her name will be Dolly Parton and she will always be outrageously clad. The dress looks great! And it's a great cause. I am passionate about a whole lot of causes, actually. Some of them sort of related to my legal work - gun control, equal rights, criminal justice - some of them not at all related to my work - supporting women in their efforts to breastfeed, social justice, and environmental causes. I wish I could do more than I do, but I generally try to stick to "baby steps" - small things I can do to help the cause, without feeling like I need to take on the world. I totally admire that this is your career! My career is great and all, but I'm definitely not in the trenches the way you are. What a fun ensemble!! 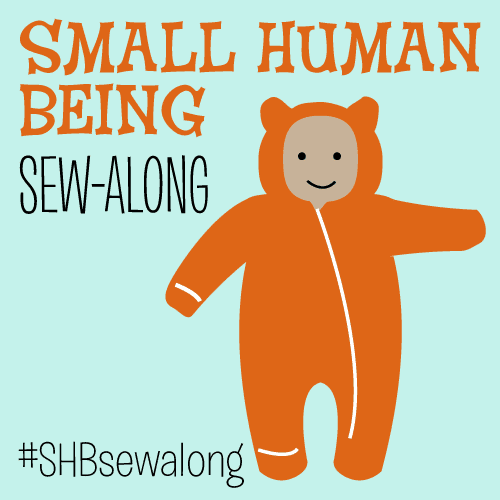 Bravo for combining your passion for this topic with your love of sewing. 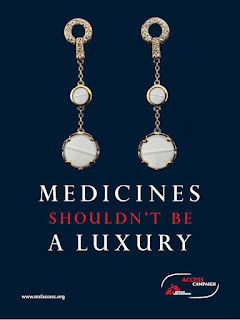 I agree 100% - medicines should not be considered a luxury item. I'm so grateful that I have a job that gives me decent benefits, but I watch my boyfriend, who I love more than life, struggle because insulin for his Type 1 diabetes is considered a surgical supply. He's insured under a state plan (no one else will touch his pre-existing condition) and the deductible is so outrageously high and surgical supplies are not even covered anyway. It kills me. Besides being passionate about equal medical care for all, I'm passionate about women's reproductive rights. Nothing sets me off faster, I'm afraid.